As you’ve clicked on to this article, you’re probably one of the many thousands of people who are curious and potentially interested about making a boat their permanent home. Whether it will have been TV lifestyle programmes, books, things you’ve read in the media, boating holidays you’ve taken, people you’ve spoken to who already enjoy this lifestyle or a combination of these and other reasons, it’s important to look beyond the romance and what you may have perceived as a stress free lifestyle of boat dwelling and come back to ‘reality’ and consider all of the practicalities of living on a boat as there are many. In fact, several of these will be given a much thorough examination in other articles you’ll find contained on this website but here are a few general observations. If you simply just wish to live on a boat but do not intend taking the boat out on long trips or you’re just looking for a static boat to live on, you’re going to need to obtain a residential mooring before you can situate your boat and quite often there are waiting lists to consider. 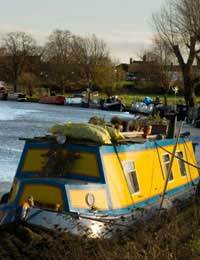 In the UK, you’ll predominantly need to contact either British Waterways or the Environment Agency about this as they are the two largest organisations which are responsible for obtaining a mooring on UK waters. If you intend your boat living to involve a lot of adventure and cruising around different places, you may need to consider the practicalities of any jobs you have and, if you have children, their schooling. You’ll also need to obtain the correct certification and paperwork. This will include a boat licence, a boat safety scheme certificate, third party insurance and you may even need to take some kind of training course, depending on your sailing proficiency. Many people will point to the fact that living on a boat cuts down upon their cost of living which has been one of the main attractions for them making the transition but this isn’t always necessarily true for all. Living on a boat can mean something very different from one person to the next and those who have saved money usually have done so because they’ve adopted a complete change in their mentality and have decided to simplify life and adopt a frugal attitude to living which has often meant making major sacrifices and compromises in order to achieve those aims. However, that might be something that you may not be prepared to do. Looking at a boating brochure or even if you’ve enjoyed a boating holiday over the spring and summer months can seem idyllic but if you’re living on a boat permanently, you’ll need to consider the cold winter months when everyday chores and keeping your boat supplied with the basics and staying comfortable become much more difficult and can cause more frustration than pleasure. There are plenty of organisations which can offer advice to those who have yet to take the plunge of living afloat which will be able to give you a better idea of whether or not you feel you could adapt to this way of life. Better still, go and speak to those who have already made the transformation. Although they’re likely to perhaps have a slightly biased view in favour of life afloat given that they’re already living this life, they are the people who will be best placed to answer any questions you might have and who will be able to tell you the ups and downs and any pitfalls you should be looking out for. Many of the other articles contained within this website will also help you to consider some of the other practicalities not discussed here.